Composting allows a grower to fertilize his food with food waste. If the food is not composted it is sent to the landfill and helps nobody. But, if it is composted indoors or outside, the result is a ready made plant food. Compost is very easy to use. A grower can add compost to quality dirt and get quality flowers. There are two standard methods types of composting: heated compost and worm composting. Making hot compost involves using aerobic bacteria to break down food scraps, etc., and turning it into usable compost. Hot compost can be made in as little as 2 to 8 weeks. The temperature of the compost pile is the key. The temperature of the compost pile can be between 100 and 160°F. A rod can be purchased to determine the temperature, or feeling by hand is an option. Turning the compost regularly and adding materials such as perlite, sawdust, and peat moss helps to add aeration for the bacteria to the pile. When the bacteria thrive, compost breakdown will happen faster. Hot composting is a good method for an impatient gardener that wants usable compost as soon as possible. Worm composting consists of using worms to consume food scraps, digest dirt and other materials, and then excrete worm castings, which is a rich fertilizer that contains most plant loving elements like nitrogen, trace elements, and humic acids. The key to using worms is to provide them with the proper temperature in the compost (60 to 75°F). The worms will reproduce and be most productive in this range. When the worms have done their job of making the compost , they should be taken out of the bin and placed in a pile. Then, a light or sunlight should be allowed to shine on the pile. The light will make the worms repel downward into the pile. Now, the compost which contains organic matter and worm castings can be collected from the top portion of the pile. This is a great way to make organic matter and worm castings cheaply, which cost an arm and a leg at the local garden centers. 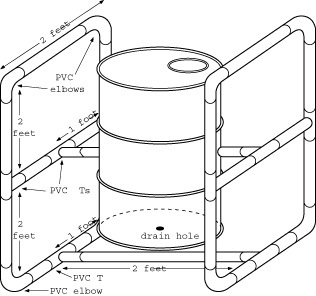 Bin construction is standard for hot composting or worm composting. 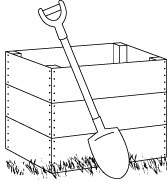 A compost bin can be made using five pieces of wood or steel that are 3×3 feet high. A matching lid may be added if a bin is used. Nice, rich-looking, fine black dirt can be layered on the bottom 2 to 8 inches. A well-draining piece of ground (no bin) works too. Add vegetable, fruit, and seafood scraps that break down relatively easily. Scraps can be blended or put through a food processor to speed up the process. As soon as the layer of food scraps is 2 to 8 inches high, it should be covered with a 1 to 4-inch dirt layer. If worm composting is the plan, a grower should place a few hundred to a thousand worms (such as Red Wigglers or African Night Crawlers) into the bin. People raise worms, and fisherman supply guys sell them. Adding common earthworms from the yard will work, too, but they are slower to reproduce and will be less thorough eaters. If the soil is already nice and wormy in that location, many more worms will be attracted to the compost pile. This cycle can now go on and on (dirt, then food scraps, then dirt). The worms are added only once. The worm population will multiply in time, and taking worms from one compost pile and adding them to a new one is an option, so that piles can decompose on a predictable schedule to allow for usable compost in the garden. It is recommended that you turn the contents of each compost bin with a pitchfork or claw periodically to help speed up the breakdown process and add air to the composted blend. For hot composting, a pile can be turned every day, every few days, or every week. A compost bin or pile can break down completely in two weeks to a few months, depending on the pile temperature and quality of compost pile. The composted material can be made more fertile by adding dolomite lime (one or more cups), up to a bag of manure when the fine dirt is added, and / or the odd dose of cottonseed meal. Tips: During the cold of winter, a decent layer of straw on top of the pile is needed so the worms will have warmth and will stay in the higher spots of the compost pile to break down new food scraps. The pile should stay moist. It should not be allowed to dry out, but it shouldn’t be allowed to become waterlogged either. The underground worm bin a good way to make worm castings because the temperature below the ground surface is warmer than above the ground in cooler conditions, yet, it is cooler in the hot months of summer. Since red worms thrive at 60 to 75°F, this location will help meet those needs. Typically, a person that raises worms will need to dig trenches, or place wooden boxes into the ground. If a trench is used, the bottom of the trench can be lined with gravel, or 6 mil black plastic with slits cuts into it so that water can drain freely. Each row can be 2 feet wide and 2 feet deep, and any length desired. If worms are kept outside over the course of a cold winter, a 4-foot deep pit can be dug and covered with insulating material like straw to protect the worms in cold conditions. During the active months of spring, summer and fall, the worm trenches should be covered with plywood to keep out bugs and birds. The bin needs to be moist, but not soaked. The care for a bin is very little labor. It will not dry out too quickly. If a grower wants to make a nice dirt mix with worm castings and soil, 50% soil and a 50% bedding mix can be used. The bedding mix can be peat moss and composted manure, or composted manure. After the worms have done their job eating the manure, they will have left their castings in the mix. This mix would work great for growing small plants for top flowers. Under optimum temperature conditions with a decent supply of worms, quality castings can be made in just a few months. As worms multiply, the number of outdoor bins can too. The four main items a vermicompost maker needs are a box, bedding, red wiggler worms, water, and food waste. Any wood or plastic box that is 2-foot by 2-foot and 7 to 9 inches high will work fine. If a plastic tub like a Rubbermaid is used, small holes can be made in the bottom for drainage using a small drill bit or sharp knife. Something should be placed underneath the box to collect the runoff moisture so that it won’t stain the floor. If no holes are made in the plastic bin, the bedding must be moist, but not soaked. An easy bedding mix is probably kicking around the house, such as 70% shredded paper product like corrugated cardboard, newspaper, or letter paper, and 30% peat moss. Since composting is being done with the red wiggler manure worm, the bedding could have any percentage of manure. Some worm raisers feed their worms composted livestock manure to eat up their smelly livestock crap and get back nice, black gold worm castings. If straight manure is used, it should be composted, not fresh and hot. The worm castings may be excrement from the worms, but they do not stink. A half cup of dirt can be added to the box too so that grit is available for the worms’ gizzards. The whole blend should be mixed thoroughly and moistened with a few gallons of water. Then the worms can be added. The beds should never dry out or become over-saturated because that is not the desired habitat of the red wiggler. The box should be covered because the worms do not like light. With a 2-foot by 2-foot bin, you should imagine dividing it into 9 equal parts, which would like an Xs and Os game. Every time a small bucket of compost is full in the kitchen, it can be buried into one of the nine equal parts. After filling all nine sites, the process can be repeated so that all of the bedding and garbage is converted into compost. At this point, all of the product can be used for the plants. Or, half of the compost can be moved into another compost bin while the other half of the bin is filled with new bedding. Now, there are two boxes with compost and fresh bedding. After this new bedding has made new compost, 1/2 of the castings can be used for the garden and the process can be repeated. Or, this effect can be multiplied and you can have four boxes on the go. When you have enough boxes and sufficient garbage, you can make a continual supply of compost by using half for the garden and the other half as starting material. Red wigglers require a temperature between 60 to 75°F to be productive eaters and rapidly reproductive. If the area is cold, a thermostatically controlled heat cord can be wrapped around the box to keep the worm bin warm. Some horticulture heat cords are thermostatically controlled at 72°F. Another option is to place a heat pad under a bin that is placed on 2x4s. Heat pads are available at drug stores. This is small scale compost making, but, it could make enough fertilizing material to grow a few flowers. If there is a good supply of composted manure from a farmer, manure can be used in place of food scraps. Indoor worm bins can be stacked up in a room to make a lot of castings in a small space, if there is enough worms and bedding to make several bins. A person can use fourteen gallon totes, like a Rubbermaid® tote for the bins because they provide enough space and they are easy to lift and stack. A ComposTumbler® can be purchased to make compost quickly, and with no mess. These are bins that heat the compost materials up to speed up the breakdown process. They are less than $200, and can be of extreme value in an apartment. A grower could make all his fertilizer with this unit, if a fresh food diet was part of his equation. You can also build your own compost turner. A real cheap method for making an easy to turn bin is to use a garbage can as the source for holding the compost. 1. Strong plastic garbage can (15 to 40-gallon). 2. Twelve 2-foot pieces of 1 1/2-inch PVC. 3. Eight 1-foot pieces of 11/2-inch PVC. 4. Eight 11/2-inch PVC elbows. 5. Four 11/2-inch PVC Ts. A. A hole should be drilled with a 2 to 3-inch holesaw, halfway from the bottom of the can. Now the can should be rotated 180° and another hole drilled at the same height. B. One of the 2-foot PVC pieces runs through the middle. This will support the can. C. Another 2-foot piece of PVC runs under the can parallel to the 2-foot piece that runs through the can. D. All 4 ends of the 2-foot PVC pieces are connected to the PVC Ts. E. Then the 1-foot lengths are connected to the T-ends. F. Now the elbows are connected the exposed ends of the 1-foot lengths. G. Connect the rest of the 2-foot pieces to the rest of the PVC elbows. H. Now the elbows should be placed to connect the vertical 2-foot PVC pieces to the horizontal 1-foot pieces. I. The eye-hooks should inserted evenly around the diameter of the bucket. Bungy cords will be used to secure the lid when the container is flipped over and over to allow for aeration. J. Finally, drill a 1-inch hole at the bottom of the can to allow for drainage. This bin can now be used for hot composting or worm composting. For hot composting, it should be rotated frequently, such as every day, every few days, or once a week.